Message from the Rector Dear Friends, the Ionian University was founded in 1984 in the historic and beautiful city of Corfu, a Unesco World Heritage Site,and until 2018 consisted of sixdepartments (History, Foreign Languages and Translation, Music Studies, Library, Archival and Museum Studies, Audiovisual Arts, and Informatics) with ﬁve thousand undergraduate and more than six hundred postgraduate students. By incorporating and restructuring the Ionian Technological Education Institute, in the academic year 2019-2020 the Ionian University will expand to henceforth comprise a total of twelve departments on four islands of the Ionian Sea (Corfu, Lefkada, Kefalonia, Zakynthos). other Higher Education Institutions and research centers on a European and international level. The traditionally open and outgoing character of the Ionian University also expresses itself on the local cultural and artistic scene with numerous events, concerts, recitals, lectures, festivals, exhibitions, seminars and international conferences, aspiring to offer our students education and culture as an integral part of their everyday university life. Along with the aforementioned departments, it will broaden its scope and also include departments of Tourism, Economics, Environment and Cultural Heritage, together with the establishment of a Research Center and several specialized Institutes. The brochure in your hands contains the essential information concerning the character, the courses and the infrastructure of each one of our twelve university departments. As you can see, our aim is to provide our students with all they need for a successful professional career and, at the same time, to offer the best possible environment for their studies, with beneﬁts which often go beyond those offered by other, larger institutions. The Ionian Islands Having been under Venetian, French and English rule for a long period of time, the Ionian Islands followed a different historical path from the other Greek provinces, which after the fall of the Byzantine Empire in the 15th century became part of the Ottoman Empire until the 19th century and the beginning of the 20th, when these territories gradually gained their freedom and joined the newly established Greek state. This different path brought the Ionian Islands closer to the western European ways of life and thinking, which, in turn, left their mark on the urban and rural landscape of the islands, on the mentality of people and their customs. It should be noted that the ďŹ rst Greek University, the Ionian Academy, was founded in Corfu in 1824, which was then under English rule. From the ďŹ rst decades of the 19th century until their Union with the new Greek State in 1864, the Ionian Islands became the cradle of a unique literary current, which largely contributed to the intellectual ferment of modern times. The Ionian University aims, besides its other objectives, to contribute to the revival and cultivation of the local intellectual heritage, a heritage partly deriving from the cultural impact of the long-lasting European relationship. The Dpt. of History, founded in the academic year1985-86, is the oldest department of the Ionian University and the only department in Greece exclusively dedicated to the study of History. It is situated in a new building in the old town of Corfu, provided with suitable classrooms, amphitheaters and other facilities. Undergraduate students are recruited in one of the following ways: a. Through the National Examination System b. Through a speciďŹ c examination organized by the University for those who already hold a degree from another department. c. A number of places, not exceeding ďŹ ve per cent of the total number of freshmen, are allocated to students with disabilities. The syllabus is concluded in 8 semesters and focuses on historical research and its methods, as well as the interpretation of historical processes from antiquity to the present time. It includes courses on all periods of Greek history, as well as well as archeology, classics, paleography, history of art, education etc. The department has incorporated in its curriculum the methods and approaches of the social sciences and both traditional and New History (e.g., economic history, historical geography, demography, history of mentalities). It also devotes a relatively substantial part of the curriculum to nonGreek and non-European history (Ottoman, North and South American history). Modern language instruction (English, French, German) and training in computer skills are auxiliary parts of the program. The students, in order to graduate, must complete 45 courses, 28 required and 17 optional, among them a dissertation thesis (all this corresponding to 240 ECTS). Teaching methods range from lecturing to large groups (in the introductory courses) to smaller seminar courses in order to actively engage students in the learning process. The Department organizes also open lectures, conferences and symposia and participates in academic agreements and exchange schemes with other European universities. The department's postgraduate programs are more specialized in speciﬁc areas and aim to train students in professionally useful skills. There are four Postgraduate Programs in the department, in the following areas: a) History and Documentation operating in three directions of study: i) History of Antiquity, ii) Byzantium and Medieval History, iii) Modern and Contemporary History, directed by Associate Prof. Konstantinos Sbonias b) Methodology on Criticism and Publication of Historical and Archival sources, directed by Prof. Grigorios Psallidas c) Historic demography, directed by Prof. Dimitrios Anoyatis d) Historical research, pedagogy and new technologies, directed by Prof. Konstantinos Angelakos (a program jointly organized by the History and Computer Sciences departments). Moreover, the department has up to now awarded over 70 doctorates, while circa 90 students are currently working on their Ph.D. theses.ntly working on their Ph.D. theses. The department runs three specialized research laboratories, that are used in combining research with teaching:  Studies of the Ancient World  Modern History Documentation  Historical Documentation and Research of the Mediterranean World. All faculty in the department maintain active programs of individual and/or collaborative research. In the publications of the Department are included Ionios Logos, the scientiﬁc journal publication of the Department, conference proceedings organized by the Department, postgraduate publications in the framework of the Department's postgraduate programs, and general publications. The four-year undergraduate studies programme is spread over eight semesters and divided into two academic specializations. During the ﬁrst four semesters, students are gradually being initiated into the theory and practice of translation by taking a wide range of courses from the ﬁelds of Language and Social Sciences, such as Linguistics, Cultural Studies and Literature, Comparative Literature, Law, Political Science, International Relations, Economics, Philosophy, etc. The overall aim is to enhance the students' knowledge as they prepare to become professional translators. During the third year of study, students may complete their studies in “Translation” or opt for “Interpreting”, which is the second specialization available in the DFLTI, after passing the intra-Departmental exams offered only to our students. In order to follow the specialization of “Interpreting” Students -apart from the written exams- must go through an interview process before a special committee consisting of interpreters, members of the Teaching and Research Staff or Associate Teaching Staff. admitted to our Department through the Panhellenic National Level Entrance Examinations, in the course of which they are also examined in two out of the department's three working languages (English, French, German). The students entitled to apply for the specialization of “Interpreting” are those who: A. have completed the 4th semester of their studies, or B. already hold a DFLTI degree in translation, or C. currently in the 6th or 8th Semester (or have completed four years), but make a written declaration that they do not wish to complete their studies in “Translation”. For those students studying translation, the focus after the 3rd year is on a range of courses in translation that include i.e. Economic-Legal-Political,Technical / Scientiﬁc and Literary Translation, Drama Translation, Audiovisual Translation, Sociology of Translation, Translation Tools. The aim of these courses is to provide the students not only with specialized knowledge, but also hands-on experience. At present, the DFLTI offers three working languages for translation and interpreting, from and into Greek: English, French and German. However, Turkish, Italian and Spanish language courses are also offered. There are two Master's Degree (MA) Programmes in the Department of Foreign Languages, Translation and Interpreting: “Science of Translation” and “Politics, Language and Intercultural Communication”. Both programmes lead to a Postgraduate Specialization Degree. Doctoral research is carried out at DFLTI on issues related to Translation Studies, Politics, Sociolinguistics, Intercultural Communication and other ﬁelds taught at the Department (e.g. Philosophy, Culture, Sociological perspectives, Literature, Law, Translation Didactics). After the successful completion of their doctoral work and a thesis defense, students are awarded a PhD. Finally, the Ionian University, has signed special agreements for jointly supervised PhDs with French (cotutelle de thèse) and other European Universities. D.F.L.T.I. hosts four research laboratories, established by Presidential Decrees. These are the “Laboratory for the Translation of Greek Literature”, the “Laboratory for Legal, Economic, Political and Technical Translation”, the “Laboratory for Geopolitical Analyses and the newly established “Laboratory for Language and Politics”. The Department of Archives, Library Science and Museology was established in the academic year 1993-1994. Since 2008, it resides in a modern new university building located at 72 Ioannou Theotoki Street, Corfu, Greece. The Department aims to provide theoretical and practical education for students in all areas related to information science, which is necessary for stafďŹ ng libraries, archives, museums and information services. Hence, the curriculum of the Department educates specialists to develop, organize and manage archival material and information, as well as library and museum collections. The Department provides its students also with education and background knowledge considered a prerequisite for both specialists that are going to serve as managers in libraries, archive services, museums and information services, as well as engage in research in relevant scientiďŹ c areas. Entry to the Department is achieved via the so-called "Panhellenic Exams", held once a year all over Greece. Graduates from other departments of Greek Universities or equivalent institutions abroad, who are interested in studying at our Department, are also admitted up to 5% of the total number of our students, after special entry exams offered every December. 2 Undergraduate Studies Studies at the Department of Archives, Library Science and Museology extend over four (4) academic years or eight (8) semesters. Students conclude their studies and receive their degree after obtaining 246 ECTS credits (European Credit Transfer and Accumulation System), which derive from successful examination in a number of compulsory and elective courses (222 ECTS), an undergraduate dissertation (8 ECTS) and two 40-day internships in libraries, archives, museums and/or other information services organisations (16 ECTS). The Department of Archives, Library Science and Museology of the Ionian University offers postgraduate studies leading to: a. Postgraduate Diploma of Specialization (Master's degree) b. Doctorate degree (Ph.D.) 1. Postgraduate Diploma of Specialization (Master's degree) In 2018-2019, the Department of Archives, Library Science and Museology of the Ionian University established a new postgraduate programme entitled “Management of Cultural Information”. Adopting approaches from the Humanities and Social Sciences, the programme examines cultural information management as a process, from its inception and production through all stages of description, dissemination, organization and presentation, by means of the formation of services such as archives, libraries, museums, publishing houses etc. The purpose of this postgraduate programme is to offer specialized theoretical and research knowledge regarding the deﬁnition, analysis, explication, management, evaluation and dissemination of cultural information, as well as practical and applied skills for the promulgation of the documentation and the administration of cultural institutions (archives, libraries, museums, publishing houses etc.). There are four ofﬁcial teaching and research laboratories: 1.Laboratory of Cultural and Historical Heritage Documentation 2. Laboratory of Information Technologies 3.Laboratory on Digital Libraries and Electronic Publishing 4. Laboratory of Museology The Laboratories aim to promote research on information technology, digital libraries, electronic publishing, cultural and historical heritage management, and museology, as well as to support the educational process. The research activities and results of the Laboratories are presented in scientiﬁc forums (conferences, congresses, seminars) and published in scientiﬁc journals and books. 2. Doctorate degree The Department of Archives, Library Science and Museology of the Ionian University offers studies leading to a doctorate degree (PhD) in accordance with current legislation and the rules of the Department's Postgraduate Study Regulations. The Department has two fully equipped and staffed computer rooms in which students are trained to use computer programmes and applications related to the courses taught. The department also offers language courses, necessary for accessing bibliographical resources as well as managing old and modern information material. Due to modern requirements both for the preservation of cultural heritage and also for accurate and timely information at all levels, a rapid development has been observed in recent years in the scientiﬁc ﬁelds studied in the Department, as well as an increased demand for specialists who cover these ﬁelds. Jobs which can be undertaken by the graduates of our Department exist in all kinds of libraries in the country (National Library, Parliament Library, University libraries, research centres and museums, public libraries, libraries of schools, ministries, hospitals, banks and other organizations), the services of the General State Archives, in public or private institutions or companies that maintain libraries and archives, in museums and any areas where information is accumulated, classiﬁed and managed. Our graduates can also work in research institutions specializing in information studies. The Department of Informatics at the Ionian University in Greece was founded within the framework of the “Operational Program for Education and Initial Vocational Training”during the academic year 2004-2005. Each year the Department accepts approximately 150 students, after they successfully completed the National Admission Exams. Master Program in Digital Applications and Innovation: the Master Program aims to deliver expert knowledge in the application of digital technologies (e.g., big data analytics, ubiquitous computing, and other) and to develop relevant skills that are necessary for critical industry sectors, such as tourism, education, health, agriculture, management etc. Master Program in Research Directions in Informatics: the Master Program aims to provide expertise in new and advanced areas of Informatics, such as information systems, artiﬁcial intelligence, data analytics, knowledge representation and management, digital entrepreneurship, bioinformatics, information security and privacy. Master Program in Digital Health and Analytics: the Master Program in Digital Health and Analytics is delivered through the collaboration of Ionian University and University of Piraeus. The Program aims to provide advanced expertise in the scientiﬁc ﬁelds of the twocollaborating departments. The following research laboratories operate in the Department of Informatics:  Networks, Multimedia and Security Systems Laboratory (NMSLab). The Networks, Multimedia and Security Systems Laboratory (NMSLab) supports both educational and research needs of the Department of Informatics, as well as other departments of the Ionian University, related to computer networks, multimedia and security.  Humanistic and Social Informatics Lab (HILab): Humanistic and Social Informatics focus on the application of ICT to extract, represent and process humanistic and social data that is derived from the respective scientiﬁc and artistic areas, like Psychology, Linguistics, History, Archaeology, Philosophy, Anthropology, Social Studies, Music and Arts.  Information Systems and Databases Laboratory (ISD-Lab).The ISD-Lab supports both educational and research needs of the Department of Informatics, as well as other departments of the Ionian University, related to information systems and databases.  Computational Modeling Lab (CMODLab): The ﬁelds of current research interests in this Laboratory include the Design and Analysis of Algorithms, Development of computational applications for non-local, non-linear dynamic systems, Signal Processing, Development of computational applications for random systems, Computational grids, and others.  Bioinformatics and Human Electrophysiology Lab (BiHELab): The Bioinformatics and Human Electrophysiology Lab focuses on recent advances in geriatrics and neurodegeneration, ranging from basic science to clinical and pharmaceutical developments. The Department of Informatics is active in research and development projects, which are associated with the research areas of its ﬁve laboratories. The Department is active in European and national research projects (http://di.ionio.gr/en/national-projects/), as well as joint partnerships and collaborations. Furthermore, the Department of Informatics is active in hosting and organizing international events, such as conferences, workshops, symposiums and summer schools. The facilities of the Department of Informatics that are available for educational and research activities include:  Computer Laboratories. There are two Computer Laboratories that support the increased teaching and application needs. They are equipped with modern computers and support equipment (laser printers, scanners, video projectors, cameras). All computers are connected through cable or wireless connection though the Ionian University Network to the Greek Research and Technology Network.  Distance Learning Room: Towards the purpose of introducing and developing e-learning and of increasing course participation in Information Society Programs, the Department operates in cooperation with the Network Operation Center, a fully equipped room with synchronous and asynchronous e-learning hardware and software. The Informatics Department graduates' may pursue a successful professional and scientiﬁc career in the Information and Communication Technology sector either as free-lance professionals, or as public or private sector specialists. Possible career prospects are:  Software Engineering  Information Systems Engineering  Network and Telecommunications  Computer Administration and Engineering  Database Administration  IT Consultancy The Undergraduate studies curriculum is developed to offer valuable assets to graduates wishing to work in education or to pursue postgraduate studies in Greece or abroad. Department of Digital Media and Communication 1 Subject of Study The Department of Digital Media and Communication of the Ionian University combines the science of Communication with Information and Communications Technologies. Digital Media Communication is an interdisciplinary ďŹ eld that has been particularly strong in recent years, as the rapid growth in the use of the Internet and Social Media has introduced new forms of communication. The use of new technologies has become indispensable in order to develop modern communication strategies and has also affected other areas such as journalism, advertising and marketing. Digital marketing and online advertising have become an integral part of the design and implementation of modern and innovative communication strategies, which primarily use new technologies to promote products and services. In the area of journalism and the media, new terms are introduced, such as electronic journalism, journalistic convergence and data journalism, all of which are based on the use of new information and communication technologies in the media. All the above concepts are analyzed and taught in the Department of Digital Media and Communication of the Ionian University. Departmental Identity In order to approach the media, it is required to endorse a social, cultural, aesthetic and, of course, technological approach, which gives our methodological practice a multidimensional texture. The Department aims to create an educational and research environment that promotes the multidisciplinary understanding of Digital Media and Communication in a constantly updated manner. The Department's curriculum focuses on Communication using Information and Communication Technologies and includes courses of different scientiﬁc disciplines such as Communication, Marketing, Advertising, Internet, Tourism, Culture, Journalism, Public Relations, Social Networking and E-Commerce. Aims and Objectives The aim of the Department is to promote the science of Communication using Digital Media, providing an academic environment in which critical thinking ﬂourishes and which facilitates research into the scientiﬁc subjects that are treated by the academic staff. At the same time, in the academic map it is positioned between departments that are purely related to Computer Science and departments that are purely related to the Science of Communication and the Media. The Department provides specialized knowledge to students in the ﬁelds of communication, digital marketing, electronic and data journalism, multimedia production, e-commerce, corporate identity management, communication strategy and public relations with an emphasis on digital media. administration ofﬁces. 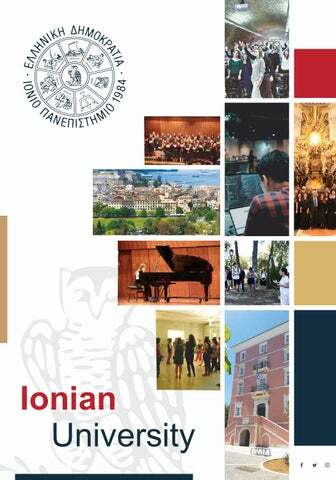 Some of the classes, the rehearsals and the events organized by the department take place at the Ionian Academy (Main Hall). It should be noted that the Ionian Academy building constitutes a historical landmark since it housed the ﬁrst institution of higher education in Greece. Students have the choice of one out of three majors. This major is indicated on the degree: Composition Performance Music Science The ﬁrst two majors certify professional efﬁciency to composers, instrumental performers, singers and orchestral or choral conductors. The third major certiﬁes efﬁciency in Music Education, Music Technology, Music Production, Musicology and Byzantine Music. Specialization is certiﬁed by the graduate program of studies. For each music major, various obligatory classes are prerequisite for the attainment of the degree. The major selected is deﬁned by the two thesis or project assignments of the last two semesters. The theoretical and practical courses of the department are complemented with numerous music events of staff and students that take place in Corfu, other places in Greece and also abroad. There has been participation at important artistic events such as the Athens Music Festival at the Odeon of Herodes Atticus (“Herodeion”), the “Demetria” Festival of the Municipality of Thessaloniki, and the Festival of Young Artists Bayreuth. Internationally acclaimed musicians are often invited to participate in concerts and other events organized by the Department. This offers the students and the public of Corfu unique artistic and educational experiences. Summer Music Academy The Music Department's Summer Academy is an initiative for further music education that began in 2003 aiming to broaden the educational possibilities of the students. It is based on the cooperation with artists and international music departments and is primarily targeted to students, teachers, artists and researchers alike. Summer Academy's seminars are taught by distinguished Greek and international artists and academics and the program includes seminars on Sonic Arts, Composition and Music Theory, master classes in Piano, String Instruments, Woodwinds, Brass, Percussion, Classical Singing, Choral Conducting, Jazz music. During the Summer Academy, ensemble concerts take place as well as recitals by teachers and students. The Summer Academy takes place in July every year. The Department's graduates can be employed as musicians and conductors of orchestras, choirs, ensembles teachers of music training in high schools and music high schools experts in cultural organizations, theaters, sound and visual studios, music publishing houses, museums, musical instruments workshops experts in radio broadcast stations music theorists and music critics in the private and public sector and in the local government organizations. The Department of Audio and Visual Arts (dAVARTS) aims at cultivating and promoting audiovisual expression through teaching and research, concerning applications of contemporary Audiovisual Technology in the wider ﬁeld of Art and Mass Communication. The achieved synthesis of the prerequisite theoretical and practical technological knowledge constitutes the required qualiﬁcations for properly educated artists and professionals in the ﬁeld of Audiovisual Arts. The curriculum aims at converging Art and Science, not only in the ﬁeld of audiovisual technological research, but also in a creative practical synthesis, in accordance with the international state-of-the-art research on Digital Culture. This results in a modern Programme, which merges Computer Science and Sensory Technology with Artistic Knowhow, that deﬁnes the required knowledge base which can be found in an emerging professional, the ' Te c h n a r t i s t ' . A d m i s s i o n t o t h e Department is performed through the National Admission Examination process. Additionally, dAVARTS admits graduates from other Greek Universities or equivalent institutions abroad. The duration of the Undergraduate Studies is 5 years. During the ﬁrst two years the students are offered all the basic knowledge and fundamental practical skills for being able to develop artistic creation through scientiﬁc knowledge. During the last three years, the creative process is in strict focus, with the students selecting courses following their individual interests. The Undergraduate Study Programme structure is based on the triptych Theory + Technology + Art and leads to an Integrated Master degree. The horizontal Thematic Sections (Theory + Technology) contribute to the basis of knowledge, onto which the creative vertical Thematic Section of Art, covering three informal directions (Sound, Image, Audiovisual), is built and supported. Through the extended course selection system, the students select the direction that will lead them to the completion of their ﬁnal thesis. The programme covers a wide range of approaches in the audio and visual technological and creative ﬁelds, providing a strong theoretical background. It combines the study of traditional forms of expression with the research into the potential uses of the new media and technologies. The acquisition of cultural preservation and visual communication language, the redeﬁnition of the process of perceiving audiovisual information, the cultivation of the ability to transcribe ideas in an audiovisual form, lead to the cultivation of skills and the development of critical thinking. The students present their work in exhibitions and events in designated venues or on the internet. Moreover, galas, our annual AudioVisual Arts Festival, lectures and seminars represent signiﬁcant educational components. In the context of these events, students get in touch with signiﬁcant personalities of Art and Science. Finally, educational ﬁeld trips and visits to widely-known artistic venues and institutions in Greece and abroad are also offered. On-the job training is actively encouraged and students are able to obtain considerable job experience in public and private bodies. dAVARTS is also organizing a Special Programme on Pedagogical and Didactic Appraisal Studies, which focuses on a deep and coherent understanding of theories and educational practices. Since 2015, dAVARTS offers the Postgraduate Programme "Audiovisual Arts in the Digital Age". It aims to create skilled qualiﬁed scientists and artists, capable of promoting the Audiovisual Art through in-depth use of science and audiovisual technology. Additionally, dAVARTS, in cooperation with the Music Studies department, offers the Postgraduate Programme “Arts and Technologies of Sound”. It aims to provide expertise in the ﬁelds of electronic music and modern Sound Art through the combination of state-of-the-art audio technologies. Finally, the department offers doctoral studies, which provide specialization in its main cognitive ﬁelds: a) in new forms of audiovisual expression, by using state of the art technology while putting special weight on their application in the artistic, communicative and educational sector b) in Theory. By obtaining a Doctoral degree the prospective postgraduate students can reinforce their artistic and professional proﬁle, continue as researchers, or teach at the university level. Since its foundation dAVARTS has understood the importance of strengthening the platforms of communication between academics and real world through Art and Science. The annual organization of the Audio Visual Arts Festival is the highest illustration of this effort, given the multi dimensionality of its program, counting with a large number of main and parallel events such as conferences, art exhibitions, music concerts, workshops and screenings. As an academic event it offers the opportunity to exhibit the results of the creative work in the ﬁelds of contemporary Sonic and Visual Arts. As a cultural event it offers to the local community and visitors the chance to enjoy artistic and scientiﬁc activities related to New Media Arts. As a scientiﬁc event it is an ideal meeting point for artists and researchers from Greece and abroad, thus, contributing to the international dialogue on the integration of audiovisual technologies in Art. Aside from the use of facilities provided by the Ionian University (housing, catering, insurance, loans, scholarships, sports, artistic activities), emphasis is placed on the development of synchronous and asynchronous teleeducation services, with the postgraduate programs implemented using state-of-the-art e-learning technologies. The graduates and postgraduates of dAVARTS can pursuit a professional career in:  free artistic expression (New Media Art, digital, analogue or a combination of both: Video Art, Digital Art, Web Art, Comics, Animation, Photography, etc.)  electronic and digital audiovisual technology  Virtual Reality and Simulation technologies  development of multimedia and web applications(Web design, interactive CD-ROM, DVD-ROM, Web applications, multimedia network data banks, experimental multimedia, video games)  Graphic Arts, multimedia publications, electronic press, advertising, professional photography  production and applications in the wider cultural ﬁeld through the use of digital and electronic technology (in museums, collections, etc.)  educational technology with the use of adaptive multimedia systems. The new Department of Ethnomusicology based in Lixouri, Kefalonia was founded on 1/10/18 according to Law 4559/2018 as a new department of the Faculty of Music and Audiovisual Arts of the Ionian University. This Faculty also includes the Department of Music Studies and the Department of Audio and Visual Arts. The department of Ethnomusicology, the ﬁrst of its kind nationally, is scheduled to begin its full academic function by the academic year 2021-22. The academic orientation of the new department is the balanced study of musical civilizations through sociology and anthropology on one hand and the performance practice of the music on the other. A new academic curriculum is being developed along these lines and the qualiﬁcations of future members of faculty will reﬂect this academic orientation. The new Department of Ethnomusicology aspires to offer its students a window into the complex modern world through the intercultural and interdisciplinary study of musical cultures ranging from traditional and geographically deﬁned musical cultures to the rapidly evolving globalized musical trends and musical languages of the 20th and 21st century. The Department of Food Science and Technology of the Ionian University in Greece is the evolution of the Departments of Organic Farming and Food Technology of the Technological Educational Institute of the Ionian Islands. Its new curriculum will start the academic year 20192020 and will admit students, after their success at the National Admission Exams. production and quality. Speciﬁcally, the lab is involved in: (i) the analyses and interpretation of soil, plant tissues, and produce, irrigation water, soil amendments, etc., (ii) consulting services and education to farmers, (iii) soil classiﬁcation and mapping, and (iv) research activities related to soil fertility and microbiology, plant nutrition and food production, and soil functions related to native biodiversity and climate change. Laboratory of Plant Physiology and Aromatic Herbs: The laboratory focuses on teaching and applied research related to plant physiology with special emphasis on in vitro propagation of aromatic herbs, and extraction and evaluation of essential oils. Laboratory of Toxicity and Bioactive Molecules: The laboratory carries out applied research on evaluation of toxicity and bioactive molecules of natural products and by-products, extraction optimization, valorization of food industry by-products in terms of bioeconomy. Laboratory of Food Chemistry and Industrial Fermentations: The laboratory carries out research focusing on fermentation technology, food chemistry, food and agro-industrial renewable resources analysis, biotechnological valorization of renewable resources (e.g. agro-industrial wastes and by-product streams) and on the development of novel bioreﬁneries for the production of added-value products. aggregometer, etc. Laboratory of Organic Crop Protection and Fruit & Vegetable Technology: Laminar Flow Cabinet, Incubators, Hot Cold Incubator, Refrigerator, Thermal cycler (PCR), Refrigerated Centrifuge, pH meter, Microscopes, Stereoscopes, Computer with big TV screen, Deep freezer, Refrigerator and freezer, Autoclave, Stirrer heating, Analytical electronic balances, Freeze dryer, Water bath, etc. Laboratory of Food Microbiology: GC, HPLC, Laminar Flow Cabinet, Seven Incubators, three Freezers, Spiral plate, Gravimat, Water baths, Molecular imager, Electronic microscope, Electronic Scales, Bag mixer, Thermal cycler, Vortex mixers, etc. Laboratory of Soil Analysis: Soil sampling devices, analytical scales, vortex mixers, shaker, centrifuges, ovens, incubators, water baths, pH meter, water conductivity meter, calcimeters, ﬂame photometer, atomic absorption spectrophotometer, UV-Vis spectrophotometer, kjeldahl apparatus, automatic CNOH-S analyzer etc. Laboratory of Plant Physiology and Aromatic Herbs: Infrared gas analyzer, surface area meter, hydrodistillation apparatus, GC-MS, rotary evaporator, balances, water bath, plant growth chamber, laminar ﬂow, centrifuge, microplate-reader, etc. Laboratory of Toxicity and Bioactive Molecules: Laminar Flow Cabinet (class II), Incubator, Ultrasonic Water bath, Analytical Scale, Rotary Evaporator, UV/vis Spectrophotometer, HPLC/UV, Extraction devices, Microscope, Microplate reader. Computer Laboratories: Computer Laboratory that supports the increased teaching and application needs. Laboratory of Food Chemistry & Industrial Fermentations: Incubators, Shaker, Ultrasonic Water bath, Water baths, UV/vis Spectrophotometers Rotary Evaporators, Kjeldahl and digestion unit, Soxhlet apparatus, Milkoscan (FTIR), -80 oC freezer, -30 oC freezer, Refrigerators, Microcentrifuge, Centrifuge, F r e e z e - d r y e r, H P L C e q u i p p e d w i t h D A D , Fluorescence and RI detectors, Microscope, pH meters, Vortex mixers, Hot-plate Stirrers, Autoclave, etc. The graduates of the Department of Food Science and Technology may pursue a successful professional and scientiﬁc career in the food sector, either as free lance professionals, or as public or private sector employees. Possible career prospects are in:  Food Industry (product design, production, quality control, handling services)  Food Analysis Laboratories  Consultants in the food sector. The curriculum for the undergraduate studies has been developed in order to offer adequate knowledge and preparation to the graduates wishing to work in education or to pursue postgraduate studies in Greece or abroad. The Department of Environment of the Ionian University in Greece started its operation in October 2018. Each year the Department admits approximately 100 students, after they succeed the National Admission Exams. Environmental Technologies Renewable energy production and management Computational methods and simulations for environmental processes and applications Information technologies for the management and processing of environmental data Geographical information system (GIS) and remote sensing technologies for the recording, analysis and modeling of geospatial data. 3 Career Prospects The graduates of the Department of Environment may pursue a success professional and scientiﬁc career in the Environmental sector either as free lance professionals, or as public or private sector specialists. 4 Infrastructure The department of Environment holds an ultra-modern newly built building (constructed in 2012) of 5.500 m2 total roofed area and circa 3.000 m2 of additional peripheral functional areas. The building is located 2.8 km from the city centre of Zakynthos. The building has a complete series of electro-mechanical support equipment (for example central a/c systems, automation, ﬁre safety, lifts for disabled access, power generator, central UPS, fast wireless Wi-Fi, video projectors, facilities for disabled). There are 12 scientiﬁc laboratories with research equipment and with teaching facilities. In addition, there exist several staff ofﬁces and lecture halls, a large modern amphitheatre, a drawing and illustration studio, a library with reading room, and a student restaurant within the premises of the department. process that should consider all its critical dimensions to improve economic prosperity and growth. Based on this theoretical framework, a modern curriculum will be developed, providing students with specialized knowledge in the respective ﬁelds of regional development science. The two advanced directions of the Department will be aided by the organization of courses that will give students a wide range of opportunities to pursue their studies at postgraduate level. Department of Tourism Establishment - Vision - Mission The Department of Tourism is a newly established department of the recently founded School of Economic Sciences of the Ionian University based in Corfu (pursuant to the provisions of Article 11 of Law 4559/2018). The undergraduate programme of studies of the Department of Tourism will welcome its ﬁrst cohort of students in the academic year 2019-2020. The Department of Tourism will be housed in the Ionian University campus located at the Old Psychiatric Hospital of Corfu. For the ﬁrst year of the Department's operation (academic year 2019-2020), it is envisaged that the existing teaching rooms will be used. Moreover, during the ﬁrst year of the Department’s operation, the lecture theatres in the central building of the Ionian University (72 I. Theotoki street) and the Laboratory of Informatics (ground ﬂoor at Galinos Building) of the Informatics Department will also be used for the students' training needs The Department of Tourism aims to provide scientiﬁc knowledge and expertise in business management and technology management for the wider tourism industry in order to provide the necessary training that leads to ﬂexible, innovative and efﬁcient management of the organizational resources of the tourism businesses. The curriculum draws on the best international academic practices of relevant departments and is based on the use of interdisciplinary approaches as well as on the use of modern ICT technologies to study the ways in which the tourism industry can be promoted, managed and transformed. As a key point of differentiation in relation to the other University Departments in Greece that study the scientiﬁc challenges of the tourism industry, the newly established Tourism Department integrates the scientiﬁc developments in the ﬁelds of administrative science, humanities and modern IT technologies in the areas of tourism and culture. The signiﬁcant academic heritage of the Ionian University in the ﬁelds of arts-culture-informatics, as well as the location of the department in Corfu, a cultural and cosmopolitan centre and a historically distinctive island in the Mediterranean, and the inclusion of these dimensions in the context of tourist activity underlie the innovation of the Department. The vision of the Department of Tourism is to constitute a key centre that develops, combines and integrates the sciences that study tourism development in order to effectively manage modern tourist and cultural businesses and organizations. Undergraduate Studies The curriculum of the Department of Tourism focuses on the following main thematic axes: I. Management of Tourism Businesses and Organizations. The ﬁrst axis seeks to equip students with theoretical and practical knowledge on up to date methods of organization, management and operation of tourism businesses, tourism destinations and cultural organizations. Indicative modules include: 'Tourism and Cultural Organization Management', 'Tourism Marketing', 'Finance and Economics Management for Tourism and Cultural Organizations'. II. Digital technologies and tourism. The second axis seeks to equip students with the theoretical and practical knowledge required for the development of tourism/cultural resources through modern ICT. Indicative modules include: 'E-business and digital transformation of tourist and cultural infrastructure', 'Development of digital tourism and cultural services', 'International reservation systems'. III. Tourism and culture. This axis aims to familiarize students with key aspects of the human culture and provide them with the necessary background knowledge in this ﬁeld that can be used in the tourism context. Indicative modules include: 'Culture and heritage tourism', 'Greek-European cultural identity', 'Characteristics, role, risks and opportunities in tourism development', 'Mediterranean societies, cultures, economies and religions (Antiquity, Middle Ages)', 'Archaeology and tourism'. IV. International tourism, language and law. This axis seeks to equip students with theoretical and practical knowledge on the management and development of tourism and cultural services in an international environment. Indicative courses include: 'Travel visa law', 'Tourism, culture and accessibility', 'Intercultural Communication'. V. Thematic tourism. It seeks to equip students with the theoretical and practical knowledge required for the development and management of alternative tourism services. Indicative courses include: 'Alternative forms of tourism (e.g. Music tourism, Marine tourism, Religious tourism, Congress tourism, Medical tourism, Cruise tourism, etc. )', 'Tourism Geography', 'Tourism and Sustainable Development'. The detailed syllabus will be ready by February 2019. The website of the Department of Tourism providing prospective students with detailed information on the Department and its undergraduate programme will be available on March 2019. Graduate Employment Prospects The curriculum is designed to broaden professional experience and work opportunities in a variety of areas of economic, cultural and social activity, both in the private and public sectors. In particular, the graduates of the Department will be able to work as: (a) Tourism businesses executives in the private sector (such as air carriers, ferry companies and operators, cruise ships, hotels, catering and hospitality companies, tour operators, travel agencies, event and conference companies, tourism marketing companies) in the several key functional areas, such as ﬁnance, strategic and operational management, research, marketing and sales. b) Executives of the broader public sector (e.g. Ministries, National Tourism Organisation), legal entities of public and private law and local government organizations (Regional Authorities, Municipalities) and of other bodies responsible for the design of the tourism policy as well as for the development, strategic planning, and promotion of either conventional or thematic tourism (such as marine tourism, conference tourism, medical tourism, ecotourism and culinary tourism). c) Employees at tourist information centres, cultural heritage interpretation centres, museums, art galleries, cultural and recreational facilities, as well as in the ﬁelds of development, design and promotion of tourism products and services. d) Executives of tourism associations and bodies (such as the Association of Greek Tourism Enterprises (SETE), the Hellenic Hoteliers Federation, the Hellenic Chamber of Commerce, the Hellenic Association of Travel & Tourist Agencies (HATTA) and others. e) Employees at business consultancies in the tourism and culture areas. f) Teaching and research staff at all levels of the public and private education/training in Tourism Studies. Furthermore, the Department graduates will have the opportunity to either launch their own business or be employed as executives at tech companies, developing enhanced technological tourism and cultural products or services, thus contributing to the growth of the creative economy. Erasmus The Ionian University international academic proﬁle is particularly established through international partnerships and the internationalization of the graduate and post-graduate curricula. The university is also proactively engaged in a wide range of EU-funded activities, being committed to promote the European dimension while ensuring that all students and staff have full and equal access to European mobility opportunities, in compliance with the transparency and equal treatment principle. institutions from European Union member countries. However, due to traditional and historic ties, the university plans to extend its cooperation strategy to non-EU countries worldwide. Aiming to promote long-term and sustainable partnerships/networks for research, teaching and enterprise, the Erasmus partnership selection criteria include academic quality and interdisciplinary approaches that are compatible with the curriculum content and the research ﬁelds of the institution's academic units. Under this perspective, the institution offers qualitative services at every stage of the Erasmus mobility scheme. Particularly, the following types of individual mobility are supported: undergraduate mobility, masters, doctorates and post-doctorates mobility faculty members/teaching and administration staff mobility. All these mobility schemes are targeted depending on the speciﬁc geographical lot concerned. Current students and university staff are targeted through a variety of evets and meeting throughout the academic year. For incoming students, the Ionian University offers a modern Greek learning annual course and a comprehensive ECTS guide covering application, accommodation, fees and ﬁnance, travel, pre-departure information and induction/orientation. A dedicated institutional Erasmus website is also available at https://sites.ionio.gr/international/en/erasmus/ providing all the updated information related to Erasmus mobility. 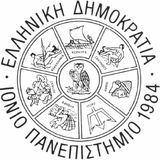 The Ionian University has been awarded the Erasmus Charter for Higher Education 2014 - 2020 (31720-LA-12014-1-GR-E4AKA1-ECHE). The Institutional Erasmus Code is GATHINE 42. Summer schools @ ionio Every Summer, the Ionian University offers a range of summer schools, festivals, music academies and masterclasses, previous offerings ranging from greek history and culture to hybrid arts, informatics to excavation techniques, intercultural communication to choral conducting. For more information, visit our website at ionio.gr, to ďŹ nd out what is available! From the academic year 2019-20 the Ionian University will expand to a total of 12 departments on 4 islands of the Ionian Sea (Corfu, Lefkada, Kefalonia, Zakynthos). Essential information concerning the character, the courses and the infrastructure of each one of the IU's twelve university departments. From the academic year 2019-20 the Ionian University will expand to a total of 12 departments on 4 islands of the Ionian Sea! Essential information concerning the character, the courses and the infrastructure of each one of the IU's twelve university departments.